Carp and Feeder black color fishing line. The dark.. 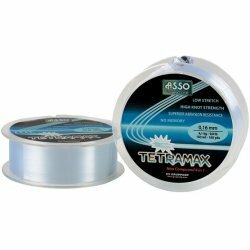 Historical line of the same range of Asso di Cuori..
Asso Tetramax is a product specifically designed t..
ASSO ULTRA CAST Parallel Spooling Technology for:..
Mikado makes every effort to ensure that products ..
Fluorocarbon on valmistatud Jaapanis. (MADE IN JAP..
STROFT GTM on number 1 kalastust tamiil. Müncheni ..
*Sinking mono *Super strong *High sensitivity..
Tamiil on valmistatud ja poolile laotatud Itaalias..
Tamiil on fluorocarboniga kaetud ja valmistatud Ja..